Another week has flown by in quite a hurry! 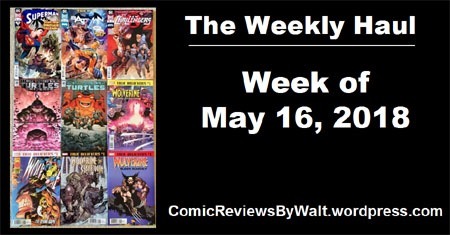 Here’s the stuff from the week of May 16! The Superman Special to cap off Rebirth and pave the way for Bendis‘ takeover. 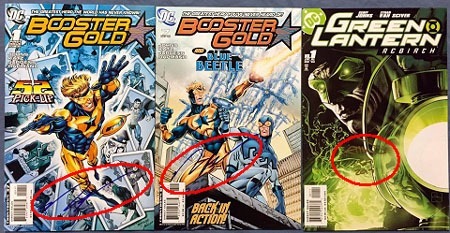 Batman has the conclusion to the Booster Gold 3-parter. And after what feels like a bunch of months, New Challengers finally premiered. 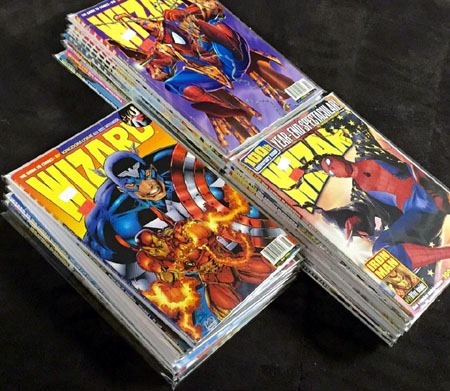 But I’ve since learned that it’s apparently “only” a 6-issue mini-series, which is really annoying to me as I’ve been SPECIFICALLY trying to AVOID new mini-series, as backed up as I am on reading and minis being concluded before I even get to reading the singles. 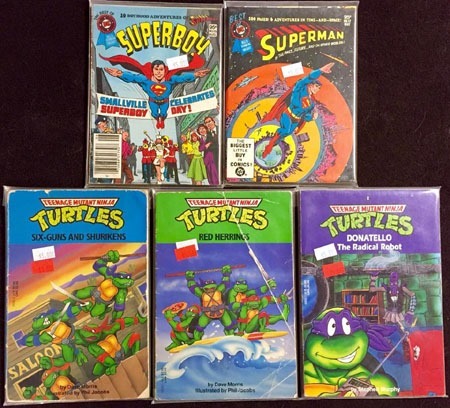 I’m even months behind on reading on both TMNT and TMNT Universe. 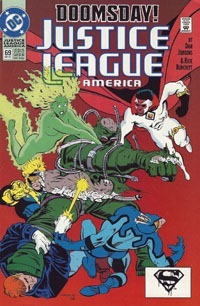 I continue to like the $1 reprints from various publishers. 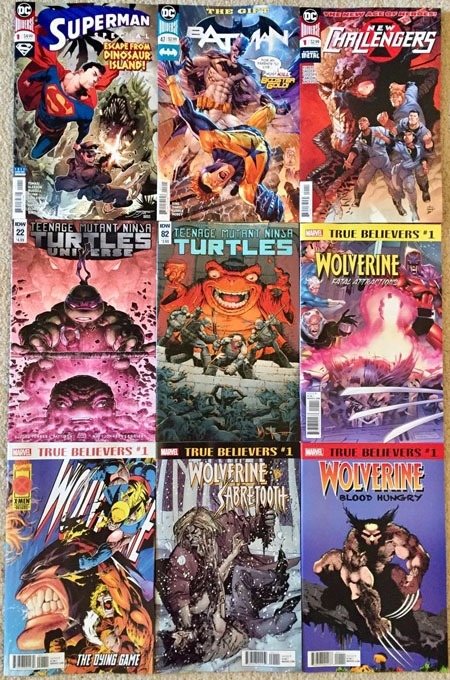 Marvel has actually reprinted two very “iconic” (to me) issues in the current round of Wolverine issues, under their True Believers #1 banner. 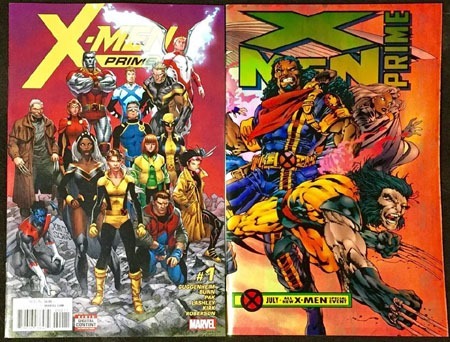 (Reprinting X-Men (1991) #25 and Wolverine (first ongoing series) #90. Hitting bargain bins, I thought I was grabbing all four issues of the Secret City Saga but in opting to NOT buy duplicates, I apparently grabbed TeenAgents #3 instead. 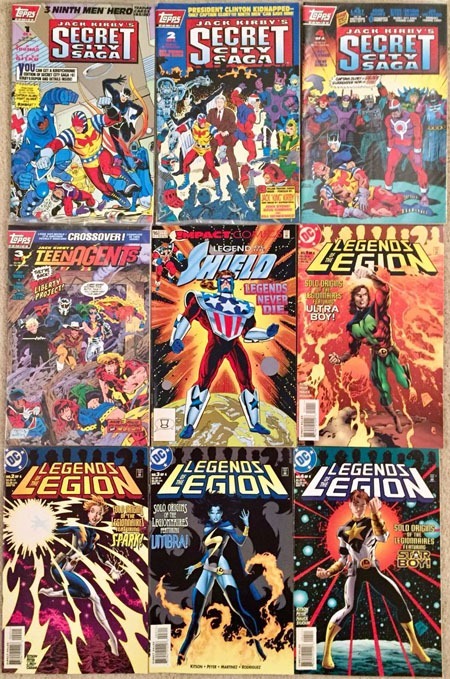 The Legend of the Shield issue grabbed my attention by the cover, and since all four issues were present I grabbed the Legends of the Legion. I pretty much do not pass up Superman #75 in the bargain bins. In this case, a copy of the 2nd printing of the “Newsstand Edition.” I distinctly remember this Kamandi: At Earth’s End issue from 1993ish because of the Superman cover. I don’t recall being consciously aware of the Dino Island comics offhand…but it’s by Mirage and Jim Lawson, so had my attention for the TMNT connection! 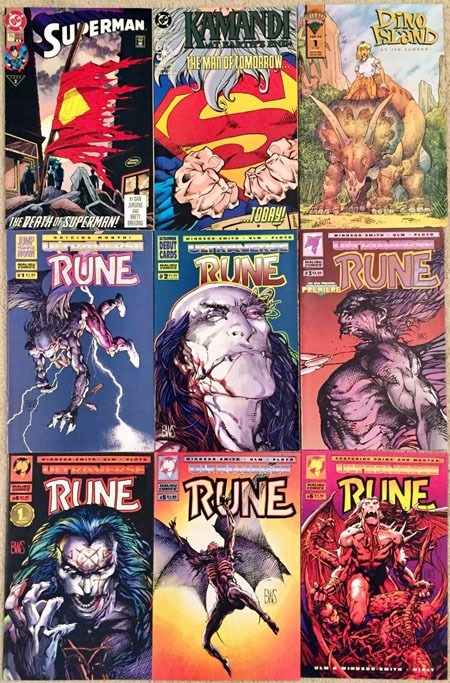 And then because there were 6 issues in a row…snagged the first volume of Rune, #s 1-6 for less than half the cost of a standard new comic. Finally, rounding things out, grabbed a Lady Pendragon #1…no idea at this point which iteration of the series this was–I remember there being several brief minis–but a bit of nostalgia there. 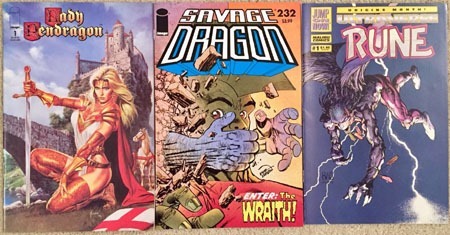 And since it was in the quarter-bin, grabbed Savage Dragon 232 since I think I left off around #230 or #231 with buying regularly, as I’d fallen behind on my reading. And apparently an extra copy of Rune #1 made it into the stack. But hey…an extra copy of Rune #1’s better than doubling up (or more) on new issues with variant covers! 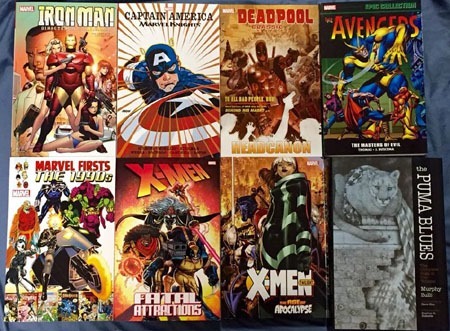 Here’s hoping the new comics for May 23 are a small bunch and nothing too plentiful. 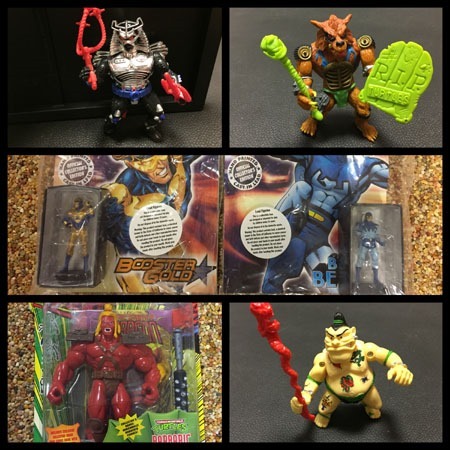 Early in the week–around January 29 or so–Big Fun of Cleveland, Ohio announced it would be closing…with a 50%-off-everything sale to commence that Friday, February 2nd. This is a store that I remember going into with a couple of friends as far back as1999 or so–basically half a lifetime ago–when it was much smaller and across the street. It recently got back onto my radar and had become extra special, a destination store, a reason unto itself to visit the Coventry area, as much so as BD’s Mongolian, and I’d been looking forward to getting several friends out for visits specifically to get them to this store in the nearish future. Having gotten some missing TMNT figures from them throughout last year, I opted to venture in for the 50% off sale…figuring ignorantly that it wouldn’t be THAT crowded. But man, was I ever wrong there! The entire store was jam-packed, as the line itself to check out snaked throughout basically the whole of the place, with one having to fight through the line itself to look at anything, and staff doing their best to attend to prospective customers in need! Ultimately, after finding what I wanted within the first 15 minutes in the place, it was another 100+ minutes standing in line to check out, and found a couple more items than planned specifically due to being in line for such a long time! 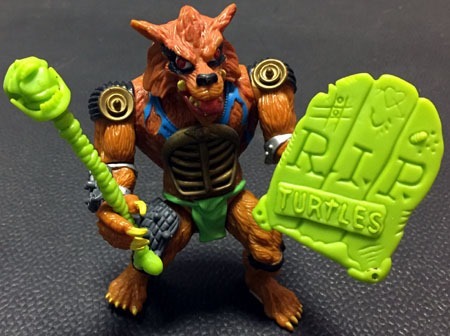 I spotted this Barbaric figure in the Ninja Turtles case. After verifying the price, I decided it was WELL worthwhile, as the 50% off put it at contemporary pricing despite being a very rare late-line figure from the trailing-off end of the original TMNT toy line! Loose in the case, but with an accessory, I spotted the best-condition Tattoo I think I’ve ever seen since I was a kid. 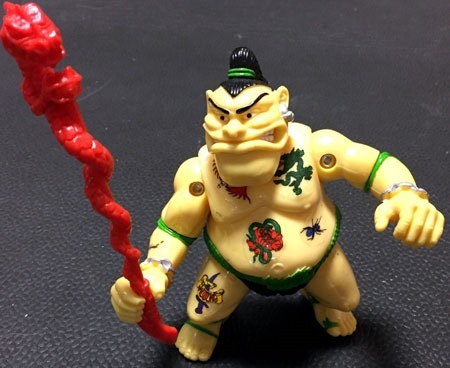 The figure’s clean, has a number of the sticker tattoos, and they don’t seem to be faded or peeling (or outright MISSING) the way they’ve been with a number of instances I’ve seen online. 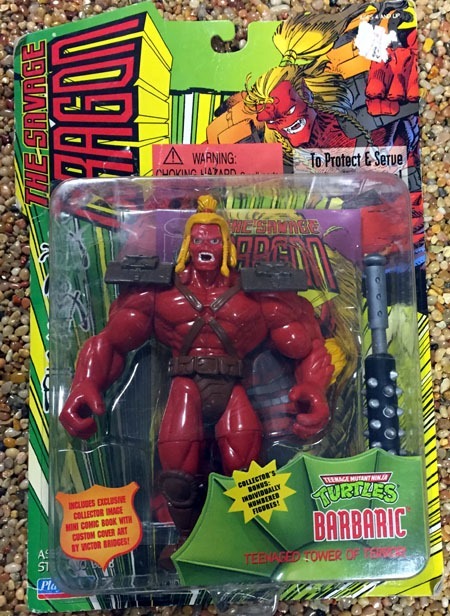 So he was a definite one to get! Knowing I was in for a long wait in line, I figured I should make it "worthwhile" and take advantage of the 50% off while I was there. So I snagged this Chrome Dome,which seems particularly shiny and clean, and comes with a couple of accessories. 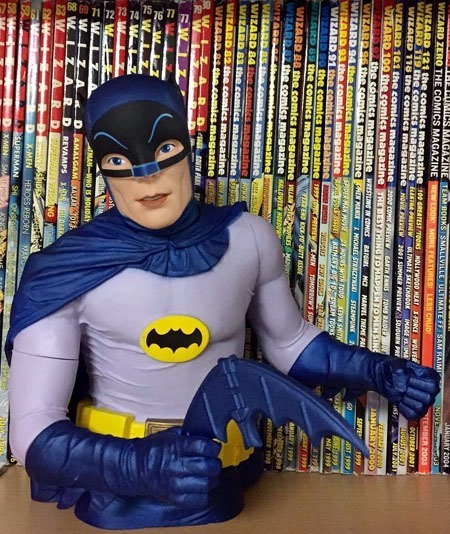 My main interest was for the wing on the back…my original figure is missing one! So this whole figure can either outright replace that, or if the part is able to be swapped without breaking anything, can complete my existing figure. 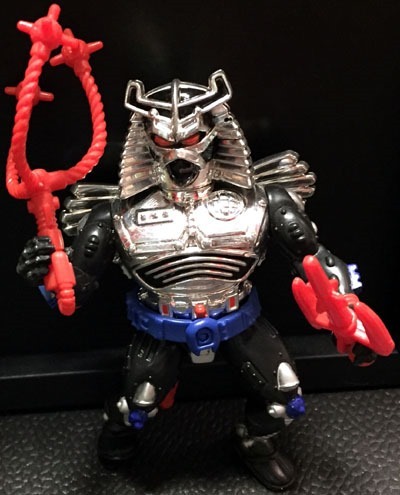 Then Rahzar was another that had accessories, and though it turned out a friend did indeed have the character, is a relatively worthwhile acquisition for the accessories. While waiting in line, I spotted a display of several of these Eaglemoss figurines. 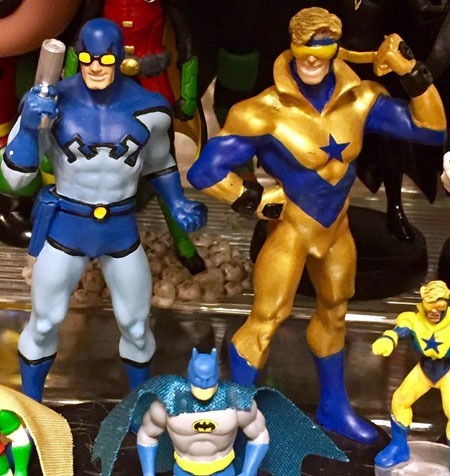 I recognized Booster Gold and Penguin as ones I had, but then spotted Blue Beetle. Then I had a sudden bit of doubt: had I merely SEEN the design/pose of Booster so many times that I only thought I had him already? 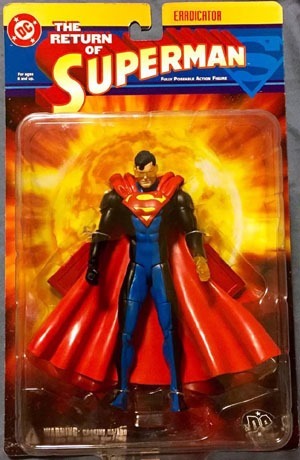 I distinctly remembered a Heroclix mini of the character in my display case, but was no longer absolutely, 100% sure that I had this one. I knew I didn’t have Blue Beetle. 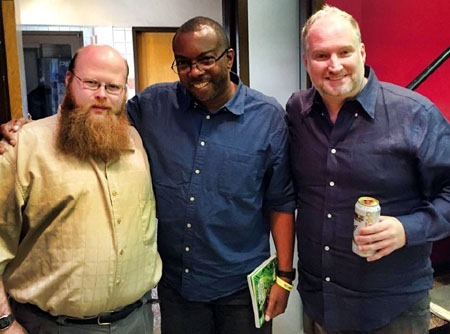 And sadly, I was unable to find any posts searching this very blog to cofirm, nor locate a photo in my phone. And since I certainly did not want to pass up either figure for the price…I bought them both. And promptly discovered on getting home that yes, I did indeed already have Booster. 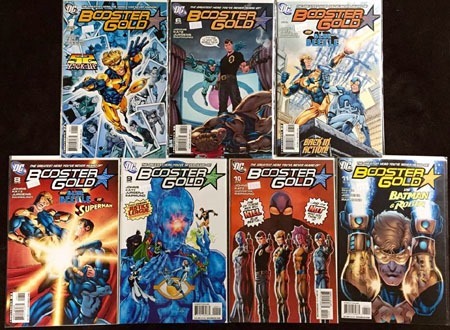 Still, for prices I’d seen online for these, and the 50% off…it was not a horrible price to pay for Blue Beetle, and the "magazine" for Booster. And hey…it means I have an extra Booster to do something with. Here they are… Blue & Gold in the display case. You can also see the Heroclix Booster that threw me off. Without getting into too much…I’m amazed at how many people showed up that first day. Further amazed when I saw a post on Facebook from the store’s Page, showing that there was a line down the block before they even opened that morning, and it was jam-packed all day. I know there were loads of toys and such on display of immense collectability, but I guess I underestimated the eagerness and widespread demand that would be triggered by a 50% off sale. I probably should NOT have been surprised, though, given my own eagerness at various places to get something for 50% off that I would pass on at "full price" but is suddenly very worthwhile at the discount. 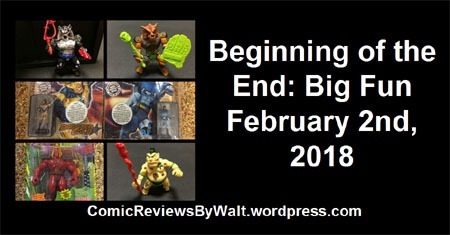 I don’t know if I’ll make it in again or not–while a couple months seems like a long time for "going out of business," I wonder at the pace of backstock from their basement being brought up and being stuff I’m interested in…and not sure about the crowds. Most likely I won’t be going back alone anyway, but perhaps with (a) friend(s) it would be worth it! 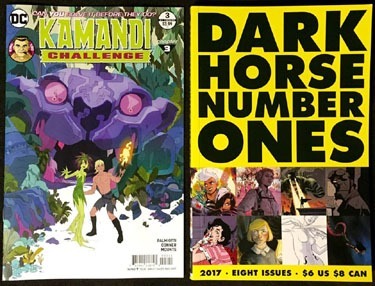 I didn’t (and haven’t, and won’t) get around to full review treatment for any of last week’s issues at this point, but I did have a few thoughts on several issues. 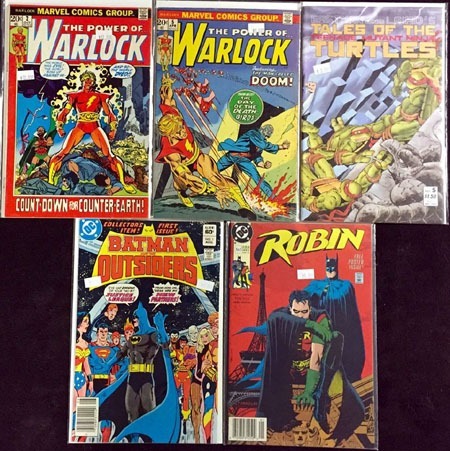 Unfortunately, I haven’t actually gotten around to reading all the new issues I bought, as Real Life has continued to be a bit of a hindrance in that department. But given a couple of purchases were made with the intention of writing about them, I figure I probably should actually write about ’em. 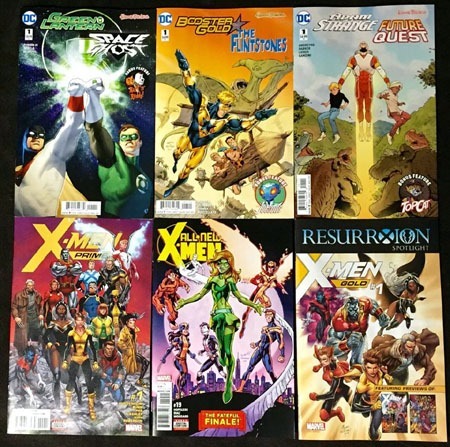 When I (premeditatively) decided I would actually go ahead and pick this issue up–despite having originally decided flat-out not to touch any of these ResurrXion titles–I’d had no idea that I would find it completely sold out at two shops before 6pm its day of release. 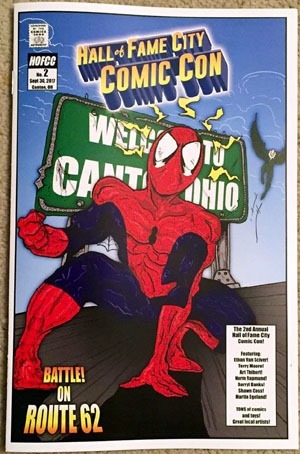 I found a copy at a third shop, which was down to only four copies at that point, including the Venom variant. I bought this issue largely on the premise that I was already buying several $5 issues, might as well lump one more into the mix…plus, I’d have no room to talk about it if I didn’t at least give it a shot myself, right? The art wasn’t all that bad…it certainly didn’t put me off the X-titles. But it’s far from being enough in and of itself to pull me in. The multiple art teams wasn’t terribly jarring, though it was noticeable…particularly when it came to Storm, due to the character’s hair style(s). The story felt rather forgettable…nothing really drew me in, and I did not feel like there was really even a full STORY here…more a through line to give us a quick tour of characters and situations that’d make up a number of too-expensive biweekly series and such. 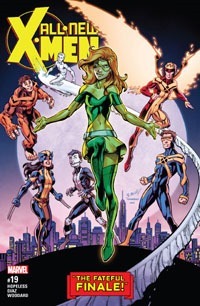 This certainly trades on NOSTALGIA, in title as well as the notion of the ResurrXion thing in general, and the forthcoming X-Men: Blue and X-Men: Gold titles. It cerainly suckered me into stuff. I read the ORIGINAL X-Men: Prime back in 1995 the day it came out, a week after X-Men: Omega, the end of the Age of Apocalypse saga. At that time, I’d been following the original Uncanny X-Men series, the original X-Men series, the original Wolverine series off and on, with a spattering of other titles…and having gotten and read the entirety of the X-family of titles the month prior to the Age of Apocalypse and then the entirety of that saga…so I was pretty "up" on the books at the time going in and coming out, so I was a ripe target for such a book, to touch briefly on numerous characters and stuff that’d "spin out" into other titles that I was planning on trying to follow. This time around? Not so much. 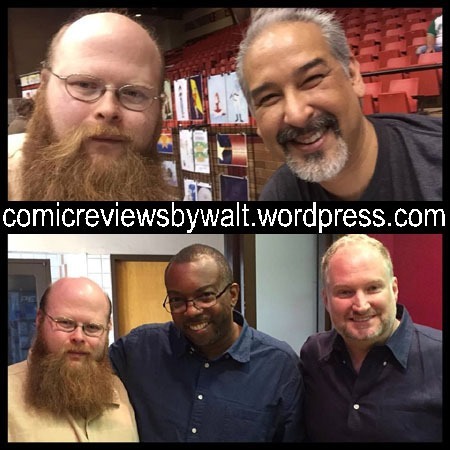 It’s telling that I almost have more to say about the original from 22 years ago than this one from a week ago! I can firmly blame my purchase of this issue on hype from Bleeding Coo, and a curiosity for more detail, and to get some actual context. 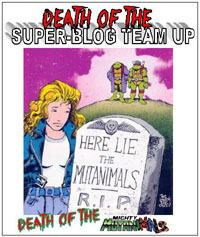 There’s also something about that cover that hit a bit of the nostalgia-trigger for me as well…perhaps the banner at the bottom identifying this as a finale, perhaps the fonts, I don’t know…but it’s telling that I was more interested in this AS a final issue than I was in a #1 for this or any of a number of other X-books when they’ve hit over the last few years. 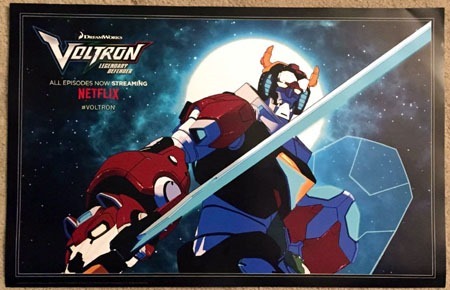 The art for this wasn’t bad; nothing overly distracting or such. I actually rather like the costumes and general character designs overall (though Jean looks a bit "off" for this cover despite my otherwise liking it). I especially like the young Cyclops’ costume…a lot like the ’90s version that I’d definitely claim as my favorite and consider THE most iconic of the character’s looks. 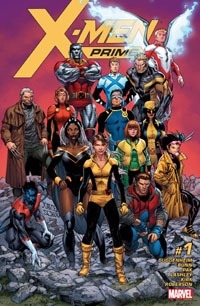 Though I already knew it going in, this issue "reveals" that the "past" these X-Men came from and have "access" to presently has their younger selves as if they’d never been pulled out of time…and thus, this young team has nowhere else to GO, and are apparently separate from the adult versions they’ve thought where their own older selves. 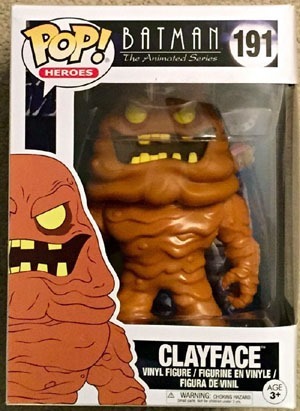 I can’t begin to guess at all the continuity or lack thereof in the last couple years since I read most of the original run of the original iteration of this title (from 2012/2013)…but this seems to cut these characters "loose," where there’s no longer a "question" of when or if they’ll go back to their own time–the adult X-Men have past selves properly in their own time, and these five apparently aren’t it, so whatever they do, they’ve got their own future/fate to forge in the present, simply AS themselves, and all their new/recent status quo elements. 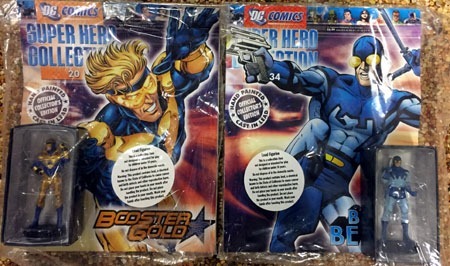 While hardly on the same level as Robin, Superman, or the TMNT, Booster Gold is definitely a draw for me. 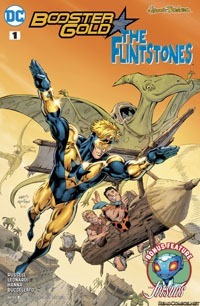 The story’s a bit light and goofy, and rather irreverent…and I don’t get much of a sense of Booster himself as a character here nor of the Flintstones characters. 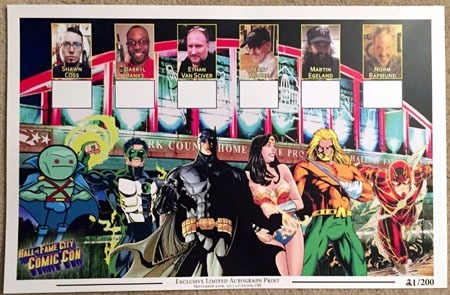 In a way, I guess that makes this a good stand-alone issue, as I don’t feel like I’m missing out on anything with any of the characters involved. The Booster side of the story seems largely predicated on what I’d consider an outdated take on the character, drawing visually on more recent takes on the character while not seeming to use his most recent ongoing series (that touched into and ended with Flashpoint back in 2011). I’m not sure how it ties in with his general New 52 stuff, but that’s because I haven’t read much of that. I was curious as well, once I got the issue, at what the Jetsons story would be, and suspected from the image on the cover that it’d involve a new take on the robot maid…and I was definitely right! The story proved to be an interesting glimpse into a new version of the characters’ lives/status quo, while also telling an interesting story of how a robot maid would be able to be such an integral part of the family. Though the $5 cover price is a bit much, for the length of the issue and its contents, the two stories, it’s mostly worthwhile. I enjoyed the issue overall, probably more for the Jetsons than the lead feature, but I did not feel like my money was wasted by having bought this. I still have the Green Lantern/Space Ghost and Adam Strange/Future Quest issues to read, as well as most of the first Flintstones volume, and assorted other "recent" issues. 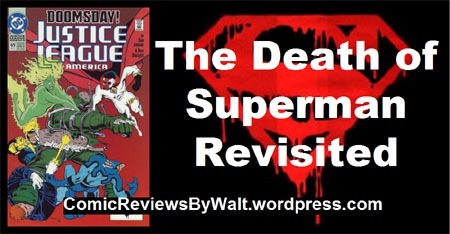 I’m hoping to keep this week a bit "small," after such an expensive week last week…looking forward to the new Superman issue, as well as needing to check for the AvP: Life and Death #4 that I missed last week. 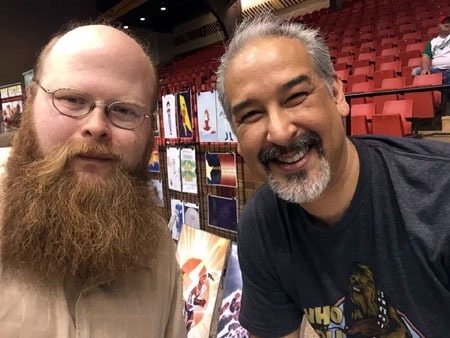 Also looks like a season of omnibii is approaching, which may get very expensive very quickly…and only a couple weeks or so until The Button, which with Superman Reborn now completed, is probably the story I’m most looking forward to for a few weeks.